Man became a living creature when God breathed into his nostrils the breath of life. When we are conceived by our parents is the exact moment God breathes life into our bodies by adding the spirit. Man’s soul is of spiritual substance for when we die the spirit and soul go to Heaven or Hell. The spirit and soul of man are eternal. Remember the rich man and Lazarus; their bodies were in the grave, yet both men had the capacities of the mind, will, and emotions of the soul. Gen 6:5 KJVA And GOD saw that the wickedness of man was great in the earth, and that every imagination of the thoughts of his heart was only evil continually. Mar 7:21-23 KJVR For from within, out of the heart of men, proceed evil thoughts, adulteries, fornications, murders, (22) Thefts, covetousness, wickedness, deceit, lasciviousness, an evil eye, blasphemy, pride, foolishness: (23) All these evil things come from within, and defile the man. The mind, since it of spiritual substance, is clean like man’s spirit at conception. However, the soul becomes more depraved, starting on day one, and sinful over time until it is evil continually producing “evil thoughts” and deceit. Man’s spirit is certainly separated from God but God still allows us to know right from wrong because it is built into our spirit. Otherwise, the men of the Old Testament would have never desired to follow God’s precepts at any time. But what we find is that many men of the Old Testament did want to do right but did not always find the power to do so because their spirit was too weak. That is not to say that it is not man’s fault that he sins, because he can prevent sin in his life by choice, but man has any extremely hard time not sinning due to the inclinations of his flesh and soul (Eph. 2:3). Isa 7:16 For before the child shall know to refuse the evil, and choose the good , the land that thou abhorrest shall be forsaken of both her kings. It is also important to know that God does not hold us accountable for ANY “sins “ that we committed as a child for there is no sin for children. Sin has no power over us unless there is a law to transgress. It is impossible to convict someone of transgressing the law when there is no law; they will walk away innocent every time regardless of their actions. However, once the law is in place, that person is bound to keep that law. One transgression of the law makes man guilty and man will be tried according to the law. Infants and children are in the process of growth spiritually, mentally, and physically. Nothing in them is fully developed including their spirits and souls which came from God. A child’s understanding is limited so that if they sin, it is not counted against them such as when an adult does wrong. When an adult transgresses the Law of the Conscience (Rom 2:14, 15) they are found guilty and are sentenced to death. Paul clearly says he was alive spiritually once when there was no law for him. That was when he was a child. Sin has no power over a child until the law comes because his conscience or spirit is not fully developed. Therefore, if he dies as an infant or child, he most certainly will go to Heaven. The first moment a person understands right from wrong then sins is the moment they die spiritually (are separated from God). Eph 2:3 KJVR Among whom also we all had our conversation in times past in the lusts of our flesh, fulfilling the desires of the flesh and of the mind; and were by nature the children of wrath, even as others. Jos 24:15 And if it seem evil unto you to serve the LORD, choose you this day whom ye will serve ; whether the gods which your fathers served that were on the other side of the flood, or the gods of the Amorites, in whose land ye dwell: but as for me and my house, we will serve the LORD. 1Ki 18:21 And Elijah came unto all the people, and said, How long halt ye between two opinions ? if the LORD be God, follow him: but if Baal, then follow him. And the people answered him not a word. Calvinism would make these verses to say that God told them to choose but He really did not mean it because man’s will is not free. God knew they could not help but to choose the evil. However, if that is true then God is a deceiver implying that they can choose Him but really they cannot. I take God at His Word and if He says we can choose Him, then we must be free to do so. It is this simple: believe we can do what God said we can do. Man’s will is neutral having neither an inclination to do good or evil. It is simply the place of choice once the mind has weighed the options. The intellect is corrupt to some degree but it also has at least some degree of good as well. The mind is not only influenced by the flesh, the devil, and the evil world but also the spirit man, God, and that which is good in the world. That is why sometimes we do good things and sometimes bad. The mind is a compilation of all input that it has accepted. Some minds are more good than evil. Some are more evil than good, even for Christians. When we are born-again our minds are not regenerated, only our spirits are. So our minds need to be renewed (Rom. 12:2) with the Word of God and the Holy Spirit. If we put God’s Word into our minds then our tendency to do good is increased. If we put the lusts of the flesh, lusts of the eyes, and the pride of life into our minds, our tendency to do evil is increased. Either way, the will is neutral. The will is simply the power of volition and it remains untouched by either influence. Like a golf ball that lands in a ditch of muddy muck, our will lands in a body and world of sin. However, that muddy muck does not make the golf ball like itself. Pick up the golf ball and wash it off and you know that the mud did not infiltrate the inner parts of the golf ball to make it muddy on the inside. Our will has landed in sin and our mind is infiltrated to some degree so that it becomes corrupted. However, the will is free, and must remain so, from the inclination to sin so that we can make a choice for good or evil. If it is not free, then it is not our fault for choosing evil, thus we cannot be condemned for the evil we do. Calvinism says it is our fault for the evil we do yet we could not help it. It is amazing that Calvinists do not see the contradiction in such thinking. Our will is free. It is our fault for our sin. We could have chosen differently but we all at some point did not and thus sinned. There are two main theories that explain how Adam’s sin was imputed unto us. One is the Federal Theory and the second is the Realistic Theory. The Federal Theory states that Adam was the federal head of the entire human race. At some point God made a covenant of works with Adam. When he sinned he represented every human being that ever lived. The theory says God imputed the sin of Adam to the entire human race based not on the race’s participation but on their representation by Adam. The problem with this theory is that there is no mention of a covenant of works with Adam in the Bible. Even so, would God actually hold us accountable for a covenant that we had no part in ratifying? Would God hold us guilty for another man’s sins? The Bible teaches that each man shall die for his own sins, not the sins of the father (Read Ezekiel 18). The Realistic Theory holds that all of humanity was physically participating with Adam when he sinned. So when Adam sinned, all of humanity sinned as well and became corrupt and guilty before God. There was a real participation of all humanity in the Original Sin thus all of humanity is condemned. The Realistic Theory is correct in that our flesh actually and really participated in the sin which is why our flesh dies. Our flesh is made of the dust of the earth. The dust on the earth today is the same dust that was on the earth with Adam. When his flesh/dust sinned so did ours for it is the same substance. It is this very substance that is cursed. Does that mean Adam’s sin is imputed to you? No, but it is imputed to your flesh. You were not there when Adam sinned. 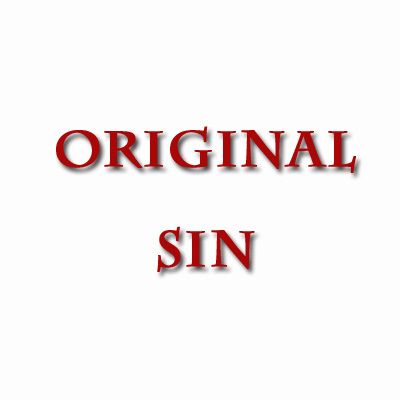 You did not personally or consciously take part in it thus you, the real you, your spirit and soul, are not guilty of the Original Sin. You are only guilty for your sins. Adam sinned and the flesh of Adam is your flesh. “That which is born of the flesh is flesh (Joh 3:6). ” Your flesh sinned and pays the penalty which is physical death. Why does man die physically? Man dies physically because of sin but who’s sin, Adam’s or our own? Since babies cannot commit sin (Rom 4:15; 5:13) and yet they still die, then we must conclude that every man dies physically due to Adam’s sin. Rom 8:10 KJVR And if Christ be in you, the body is dead because of sin; but the Spirit is life because of righteousness. This verse points out that if you are born-again, the body is dead because of sin but our spirits are spiritually alive because we are righteous (2 Cor. 5:21). There are only three types of death in the Bible: physical, spiritual, and eternal. Physical death is the separation of the spirit and soul from the body. Spiritual death is the separation of the life of God from man. Eternal death is the final death where the spiritually dead are cast into the Lake of Fire. Since the death spoken of in Romans 8:10 could not be talking about physical or eternal death, one must conclude that it is talking about spiritual death, a separation from the life of God. Joh 3:15-16 KJVR That whosoever believeth in him should not perish, but have eternal life. (16) For God so loved the world, that he gave his only begotten Son, that whosoever believeth in him should not perish, but have everlasting life . Joh 10:28 KJVR And I give unto them eternal life; and they shall never perish, neither shall any man pluck them out of my hand. Gen 2:17 KJVR But of the tree of the knowledge of good and evil, thou shalt not eat of it: for in the day that thou eatest thereof thou shalt surely die. Notice God said in “the day” that you eat you will die. We know it must be talking about spiritual death because Adam did not die physically that day. Rom 8:10 KJVR “And if Christ be in you, the body is (spiritually) dead (separated from the life of God) because of (Adam’s) sin; but the Spirit (or spirit of man) is life (zoe) because of righteousness.” Parentheticals added by author. Gen 3:19 KJVR In the sweat of thy face shalt thou eat bread, till thou return unto the ground; for out of it wast thou taken: for dust thou art, and unto dust shalt thou return. Man is made of dust. A return to the dust means all men die physically and this is due to Adam’s sin. Psa 51:5 KJVA Behold, I was shapen in iniquity; and in sin did my mother conceive me. Psa 58:3 KJVA The wicked are estranged from the womb: they go astray as soon as they be born, speaking lies. Job 14:4 KJVR Who can bring a clean thing out of an unclean? not one. Psa 14:2-3 KJVR The LORD looked down from heaven upon the children of men, to see if there were any that did understand, and seek God. (3) They are all gone aside, they are all together become filthy: there is none that doeth good, no, not one. Rom 3:9-12 KJVR What then? are we better than they ? No, in no wise: for we have before proved both Jews and Gentiles, that they are all under sin; (10) As it is written, There is none righteous, no, not one: (11) There is none that understandeth, there is none that seeketh after God. (12) They are all gone out of the way, they are together become unprofitable; there is none that doeth good, no, not one. It is important to note that all the above verses are referring to the natural man, i.e. the flesh. Notice none of these verses mention man’s spirit. You will never find a Bible verse that says we are born sinners in our spirits. You will, however find many verses saying we are born of God in our spirits and we are born upright in our spirits since we are born of God. The point is, we are all sinners, guilty of sin and having a sin nature, on the outside, even children. When we grow up, we all also become sinners, guilty of sin, on the inside. Religious tradition has brainwashed us into thinking we are born sinners spirit, soul, and body but I dare you to find one Scripture that actually says that – just one. 2Co 5:21 KJVR For he hath made him to be sin for us, who knew no sin; that we might be made the righteousness of God in him. (ALT) Trustworthy [is] the word and worthy of all acceptation, that Christ Jesus came into the world to save sinners, of whom I am first [fig., the foremost of all] . (AMP) The saying is sure and true and worthy of full and universal acceptance, that Christ Jesus (the Messiah) came into the world to save sinners, of whom I am foremost. (CEV) “Christ Jesus came into the world to save sinners.” This saying is true, and it can be trusted. I was the worst sinner of all! (Darby) Faithful is the word, and worthy of all acceptation, that Christ Jesus came into the world to save sinners, of whom I am the first. (DRB) A faithful saying, and worthy of all acceptation, that Christ Jesus came into the world to save sinners, of whom I am the chief. (EMTV) Faithful is this word, and worthy of all acceptance, that Christ Jesus came into the world to save sinners, of whom I am first. (ESV) The saying is trustworthy and deserving of full acceptance, that Christ Jesus came into the world to save sinners, of whom I am the foremost. (GW) This is a statement that can be trusted and deserves complete acceptance: Christ Jesus came into the world to save sinners, and I am the foremost sinner. (HNV) The saying is faithful and worthy of all acceptance, that Messiah Yeshua came into the world to save sinners; of whom I am chief. (ISV) This saying is trustworthy and deserves complete acceptance: To this world Christ Jesus came, Sinful people to reclaim. I am the worst of them. (LITV) Faithful is the Word and worthy of all acceptance, that Christ Jesus came into the world to save sinners, of whom I am chief. (MKJV) Faithful is the Word and worthy of all acceptance, that Christ Jesus came into the world to save sinners, of whom I am chief. (MRC) It is a faithful word and worthy of all acceptance, that Messiah Yeshua came to the world to save sinners, among whom I am first. (Murdock) Faithful is the declaration, and worthy to be received, that Jesus the Messiah came into the world to give life to sinners, of whom I was the primary. (WEB) The saying is faithful and worthy of all acceptance, that Christ Jesus came into the world to save sinners; of whom I am chief. (Webster) This is a faithful saying, and worthy of all acceptation, that Christ Jesus came into the world to save sinners; of whom I am chief. (WNT) Faithful is the saying, and deserving of universal acceptance, that Christ Jesus came into the world to save sinners; among whom I stand foremost. So there are two dissenters out of twenty-four in the list. The important one to note is the one with the Strong’s Greek definition. The original language definitely is in the present indicative. I think we can safely conclude he was talking about the present state of himself. What part? Surely not his spirit for he is the one that wrote we are the righteousness of God in Christ referring to his spirit (2 Cor 5:21). It must be talking about the flesh. He according to the flesh was still a sinner – having a sin nature. But the full redemption of our bodies is set for a future day at the resurrection. So, currently, even Christians are sinners on the outside but righteous on the inside.